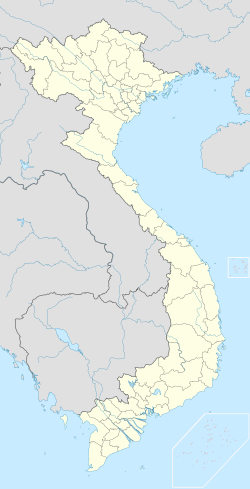 District 3 (Vietnamese: Quận 3) is an urban district of Ho Chi Minh City, the largest city in Vietnam. As of 2010, the district had a population of 188,945, a total area of 5 km². It is divided into 14 small subsets which are called wards (phường), numbered from Ward 1 to Ward 14. This district borders District 1, Phú Nhuận District, District 10, Tân Bình District. It is the location of Xá Lợi Pagoda, the largest in the city. The Vĩnh Nghiêm Pagoda is also located in District 3. There are many French-style villas in this district. British International School Vietnam has the Tu Xuong Primary campus. ^ "Website of Consulate General of Germany in Ho Chi Minh City of Germany in Ho Chi Minh City". Retrieved 20 June 2016. ^ "Contact Us." British International School Ho Chi Minh City. Retrieved on November 12, 2017. "Tu Xuong Primary Campus 43 – 45 Tu Xuong Street, District 3, Ho Chi Minh City, Vietnam"
This page was last edited on 18 March 2019, at 12:23 (UTC).